There’s the kind of hair damage you face after excessive bleaching or over relying on your heat tools, but then there are the hair issues that keep on happening that you just can’t explain. These can be aplenty: fade, dullness, dehydration and just a general limpness to your strands. Truth is, the answer may lie within your water supply. In actual fact, there isn’t just one type of water flowing through your drain. Different cities, states and countries can all have either hard or soft water coming through the tap, depending on the minerals contained in it. 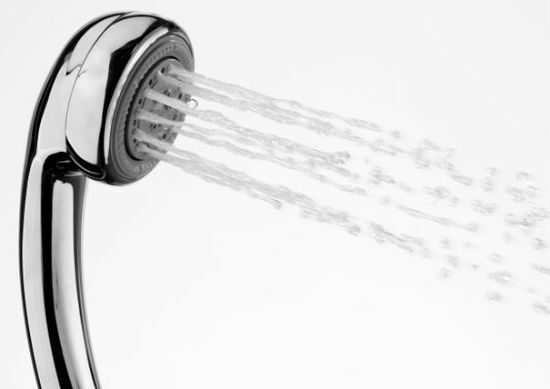 Hard water contains more calcium or magnesium—and is responsible for all of the white mineral sediment showing up in your shower—whereas soft water contains sodium. It’s why you might feel like you had the best hair of your life while on vacation, but dull, blah hair when you return. In the US, it’s said that 85% of us live in hard water territory, with Texas, New Mexico, Kansas, Arizona and Southern California being the hardest hit. Living in New England, the Pacific Northwest or Hawaii? You’ve got the softest H2O. Some people report that hard water actually feels harder on their skin, however the main way of identifying your supply is to look at the lather formation when you mix soap and water—hard water will sud up much less than soft. How Does Your Water Affect Hair? Soft water is not necessarily better than hard water for your hair; in fact, both can have different benefits for different hair types. For fine hair types, soft water can be an annoyance. You may notice your hair is left feeling more greasy and weighed down but it can be easily adjusted by using volumizing shampoo and stronger holding hair styling products. You may also find that it takes a little longer to rinse out your shampoo and conditioner. Whenever I wash my hair in soft water, I always feel like it’s a little slippery and you just need to get used to it. If you need to bring the texture back? Offset with a little dry shampoo. But for hard water, “it may be that your shampoo doesn’t lather quite as much,” she explains. Your hair might be more dry and lacks shine. Some people might even feel like their hair is more damaged because of the water. It may not happen for every hair type, but if you’ve recently moved into a hard water zone and are feeling dulled effects, counteract with a nourishing mask, or repair mist. Looking for a long term solution? Invest in a shower head filter, which will remove the offending minerals. How Does it Benefit Hair? If you have coarse, damaged or frizzy hair, soft water is the better supply for you. It will help to tame and smooth unruly hair. On the flip side, while hard water can cause a buildup of minerals and weigh your hair down, some fine hair types report a better, grittier, less oily texture to their hair after washing in hard water. Unfortunately, like most environmental elements, both types of water can play a part in fading your color. Hard water contains large amount of minerals and higher PH that causes hair color to fade more quickly and deposit on the hair shaft to cause a brassy tone and make hair color dull and lifeless. However, soft water can leave your hair feeling heavy and weighed down. The best is to avoid the washing your hair more than really needed. Use a dry shampoo instead of washing every other time, and when you do shampoo your hair, follow with a color enhancing treatment to boost up your hair color and shine. Try our Custom Made Tinted Color Enhancing Conditioner, to refresh, revive and repigment. Bottom line? It’s a pro and cons situation to both hard and soft water types out there. And there’s always a chic braid.